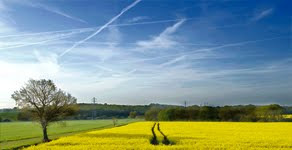 Hi everyone Sue here, joining you this evening with a post about stencilling. 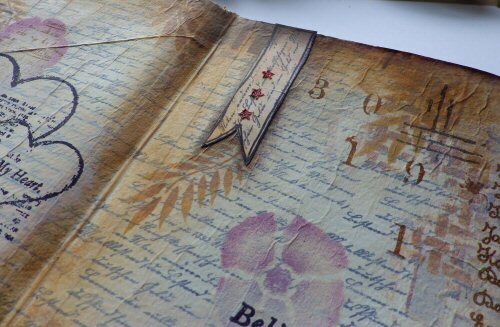 I've really enjoyed working in one of my journals recently and when I was thinking what to do for this post my mind wandered off down the vintage book trail and that led to a vintage journal page ! 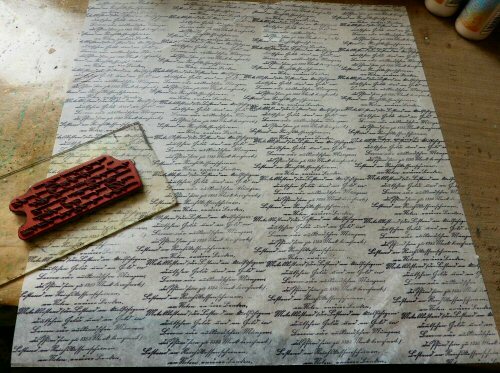 Step One: I wanted to have some text as the base layer of my page and rather than use book paper I chose to stamp the script stamp from the Sara Naumann ESN11 set onto tissue paper using black Archival ink. Step Two: This was then glued onto the journal page and a coat of Glue 'n' Seal was brushed over the top to protect the tissue paper from the layers of paint to come. While the tissue was still wet with glue I tore off the excess from around the edge. Step three: I started stencilling using the EEG016 stencil first of all using Toffee Fresco Finish paint, then I went back over it but moving the stencil slightly to one side using Nougat Fresco Finish paint. I then took a baby wipe and wiped Nougat over the whole page, this knocked the stencilling back slightly as well as the background text. Step four: I tend to group my stencilling initially while I build up layers, so I used Toffee again with a basket weave stencil overlapping the initial stencilling. Step five: I continued stencilling using the same colours and using the bumping technique again with TCW Mini Numbers stencil and also using the Lin Brown ELB006 stencil. 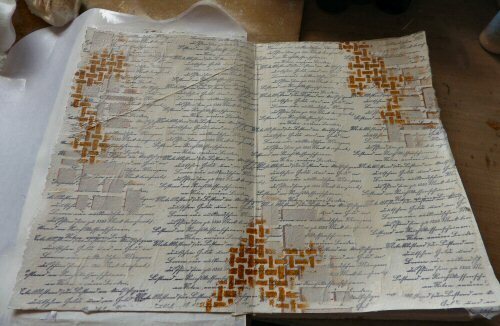 I then used Nougat with a baby wipe over the whole page and then Vintage Lace around the edges and down the centre spine. Step six: I added some small numbers using Chocolate Pudding and the PS021 stencil and the bars using the EEG018 stencil. I then stencilled the flowers using the Lin Brown ELB003 stencil. I used Vintage Lace first, then mixed it with a little Spanish Mulberry and kept the darker colour to the outside of the flower. 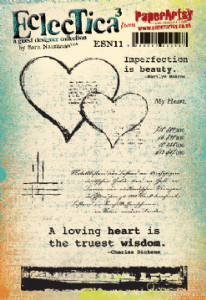 I used the text stamp from the Sara Naumann ESN14 set and stamped it with Potting Soil Archival ink through the stencil. 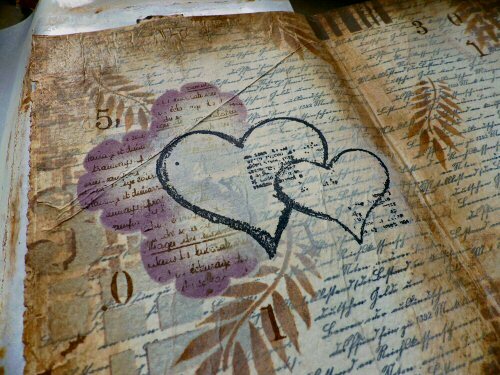 Before stamping the hearts from ESN11 I used a baby wipe again and wiped Nougat over the stencilled flowers to knock back the colour then stamped the hearts with black Archival ink. Step seven: The words My Heart are also from ESN11 and I've stamped them onto the smallest heart. 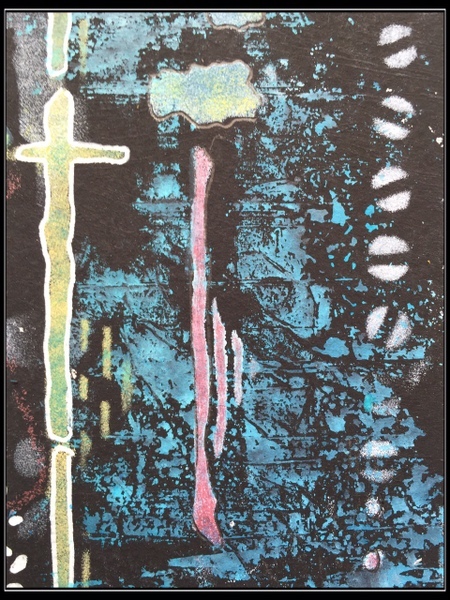 I was intrigued by a technique that Lin Brown shared recently here which is to use Grunge Paste and mica powder through a stencil. So, after convincing myself I would mess it up, I gave it a go and love it ! The stars are all done using this technique with the EEG018 stencil. Step eight: The sentiment is from the Sara Naumann ESN15 set which I thought was rather apt when trying out the Grunge Paste and mica powder technique! 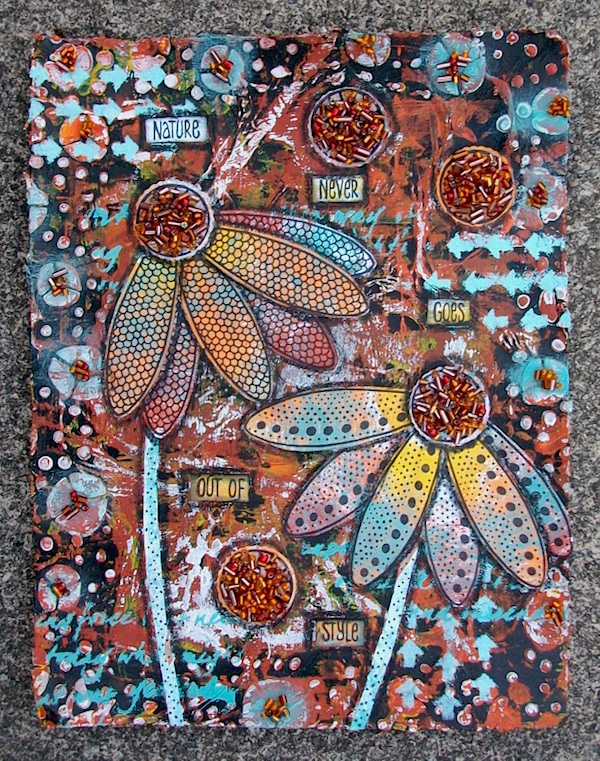 I've used the Lin Brown ELB003 stencil and the same colours as the first flowers. 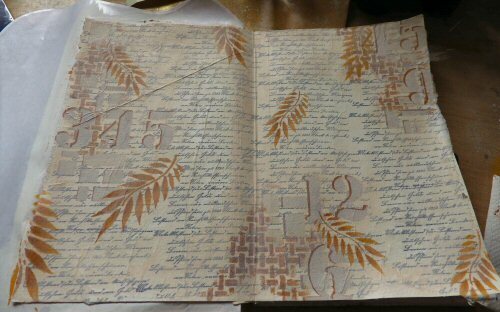 I wiped more Nougat down the right side of this page and then used the stamp from the ESN14 set with Potting Soil Archival ink. Step nine: I covered some Smoothy Card with a left over piece of stamped tissue paper then stamped it with the tag shape from Emma Godfrey EEG05 set, cut it out and before gluing it down used a Gelato to add a shadow. I rubbed the Gelato around the edge of the page to age it. then added three little stars to the tag. To finish the page I painted some lace and little lace buttons with Nougat and added the last bit of stamping using the Sara Naumann ESN11 set and Watering Can Archival ink. Stencilling is such a fantastic way to add depth and interest to your project and what I love the most is that you can do it on anything from a card to a canvas. 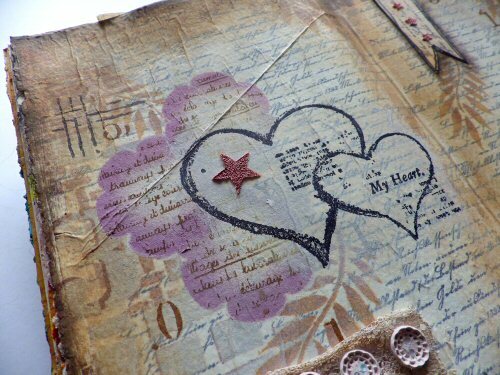 If you're new to stencilling then using a journal is a great way to experiment. Oh how fabulous Sue ... the way in which you have built up the layers is perfect. The depth that this project has is first class. Love that Lin's technique turned out, it adds such a delicate effect to the already aged background. Thank you once again for your creativity. 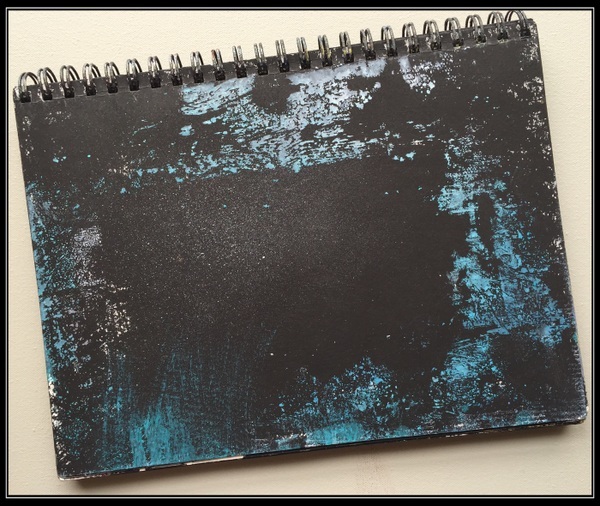 We would love you to join in with challenge #12: Stencils If you are inspired by any of our guests who blog with us over the fortnight, then please join in and link up your creativity HERE. All links go in the draw to win a voucher to spend on products of your choice from the PaperArtsy online store. The Stencils link will close 17:00 (London Time) Sunday, July 12th winner will be announced 2 hours later at 19:00. Hi gang. Seth here. 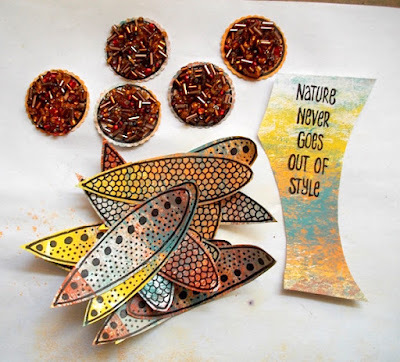 I am happy to be back on the PaperArtsy blog with a project all about stencils, an art product that is currently riding a huge wave of popularity. 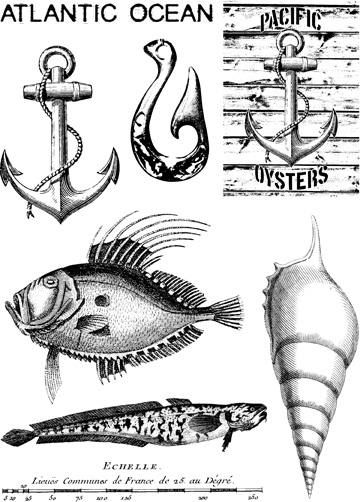 Some of you may know that I am a designer for StencilGirl Products. 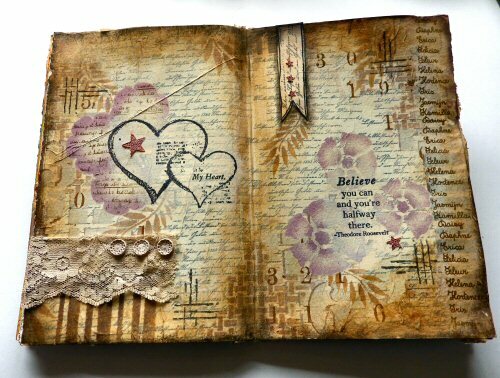 The journal page I am presenting here is made using some of my own favorite designs. 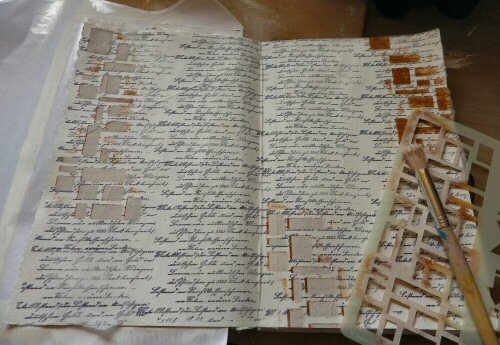 My current journal is a wire-bound book filled with 140lb watercolor paper. 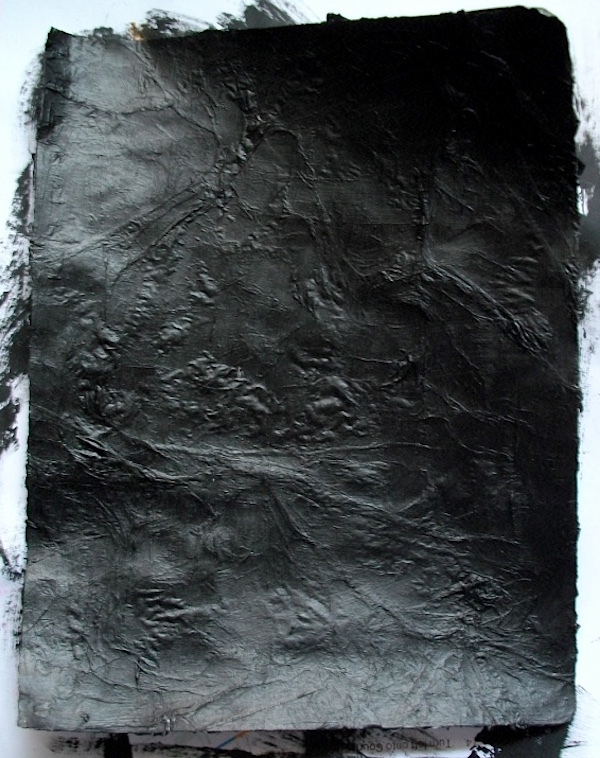 As with every page, this one started with a layer of black gesso. In random fashion, I then added Fresco Finish Acrylic Paints in Lake Wanaka, Beach Hut and Space Cadet. I also watered down Snowflake and added a fine splatter using a brush. Then I broke out the stencils. I used many individual segments from my Urban Outsiders stencil to create the frame. Using a dauber, I added Haystack as the first layer and then a bit of Beach Hut as the second layer to add dimension. 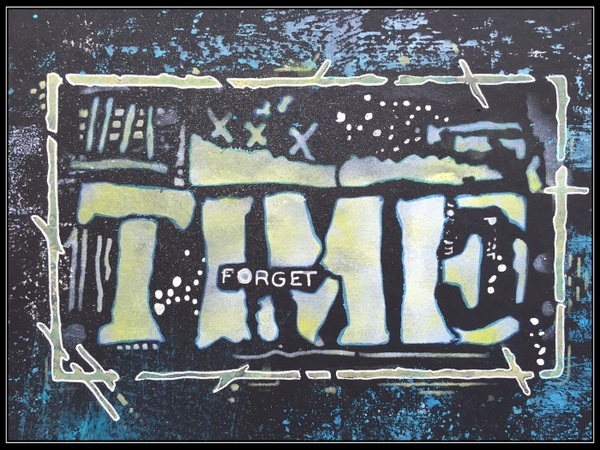 I chose several sections from my Story Time stencil to highlight the word TIME as well as other textural elements. My first layer was Antarctic and the second layer was Limelight. Several colors of gel pens were used to both create some of the stencil designs and to add outlines. My next step was to pick and choose sections from my Inside Out, Timeless, and Past Present Future stencils to add more design and color. For this step, I layered Antarctic, Beach Hut, London Bus, Mermaid, Haystack and Space Cadet. 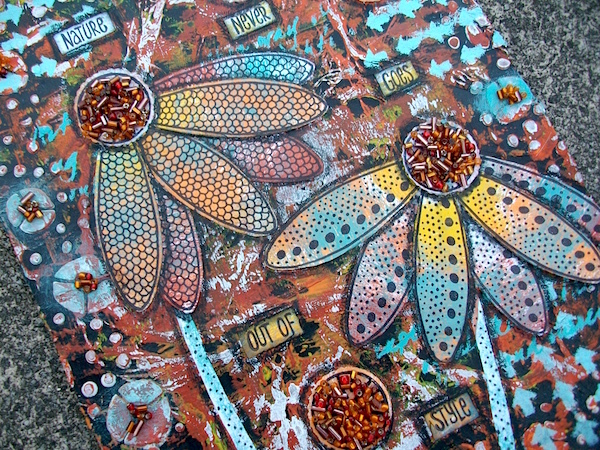 Many of the stenciled elements were then outlined with gel pen. As a final touch, random marks were made using wax pastel crayons. I love using parts of commercial stencils rather than whole stencils as a way to make sure that the artwork I create is unique and completely mine. 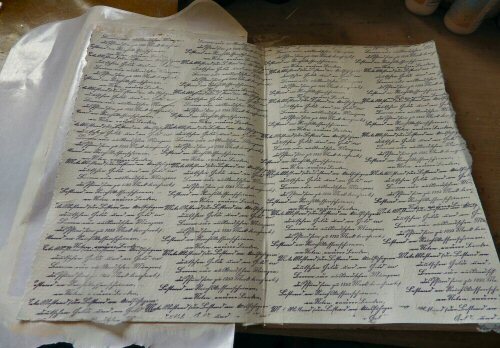 Some of my favorite bits on this journal page can be found below. 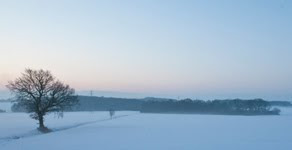 I hope this has inspired you to break out and layer up your stencils. Until next time. Seth this is such a yummy page, I love the deep blackness of the background. This shows so perfectly how good the coverage is from our opaque Fresco paints, as they easily keep their intensity over the black. All links go in the draw to win a voucher to spend on products of your choice from the PaperArtsy online store. The Stencils link will close 17:00 (London Time) Sunday, July 12th, winner will be announced 2 hours later at 19:00. Hi Clare here with a starry tag tonight. I am using one of my favourite stencil techniques 'the wipe back' sounds like a surfer move or something doesn't it? Step One: Haystack Fresco paint all over Smoothy cardstock and then a layer of Zesty Zing Fresco paint. 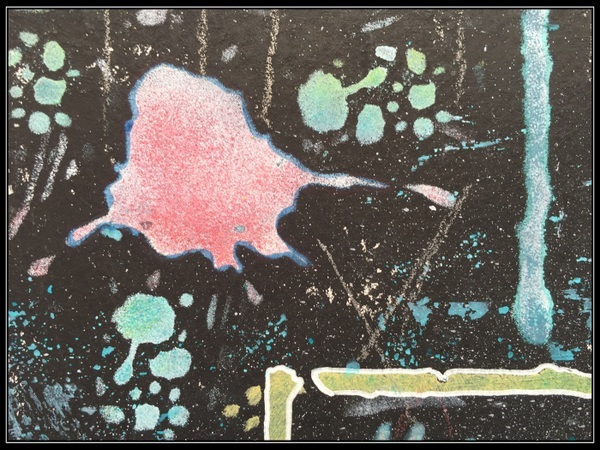 I wiped back using EEG016 stencil, stamped using EEG06 and Buttercup Archival Ink. Step Two: Once yellow layer was completely dry I painted over with a layer of Little Black Dress Fresco paint and wiped back with EEG018 stencil. Step Three: I decided to stick my background onto a tag, applied a little Indigo Treasure Gold around the edge and stamped stars to the right hand side of the tag using EEG06. Step Four: I stamped/coloured one of my girl images from ECL05 with watercolour pencils and cut her out. I felt that I needed to extend her body a little so she looked in proportion on the size of Manilla Tag I had chosen. 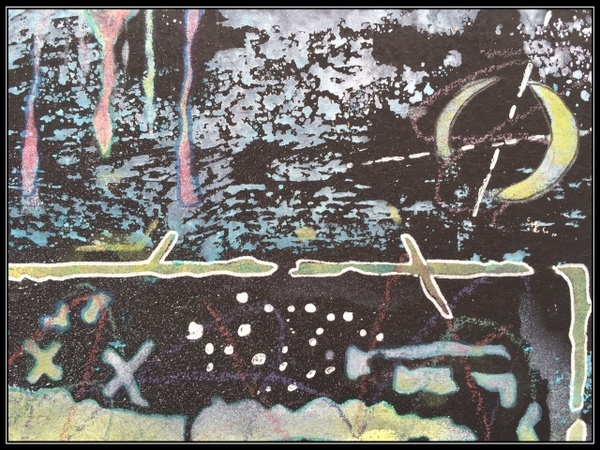 To bring my tag together I stamped a little sentiment and some stars from EEG06 onto Haystack Fresco painted card. I even painted some tape and stamped it using Black Archival ink. It was great to cut away the hearts around my girl and utilize the image in another context by looking up to the stars instead! Try and look at your stamps in that way, especially when journaling. Notice I coloured her hair grey, though I understand dyeing your hair grey is a trend with the young. I have never been trendy in my life and choose silver grey as I believe we should reflect the real us more often...wink! Find me on my blog or Instagram. Gorgeous layered silouhette effect Clare, love the midnight sky effect, stars and the unique silver hair colouring you opted for. Thanks for sharing your creativity. All links go in the draw to win a voucher to spend on products of your choice from the PaperArtsy online store. Stencils link will close 17:00 (London Time) Sunday, July 4th, winner will be announced 2 hours later at 19:00. 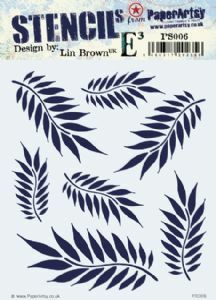 Hi everyone, Diana here from Velvet Moth Studio, and I'm joining you tonight with a post about stencils. I use them a lot in my work and I was thrilled to be asked to do a project with them. 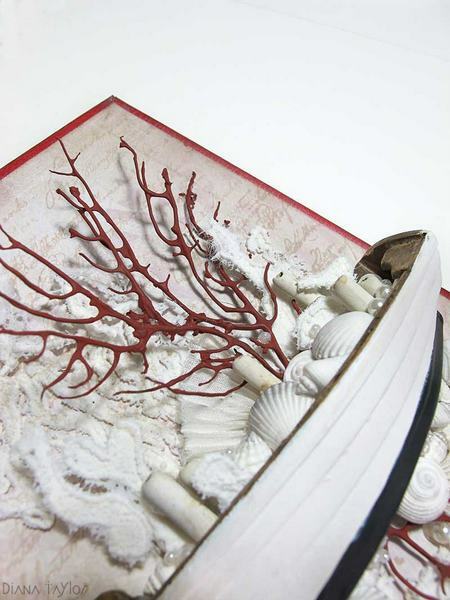 This is what I came up with, a small boat filled with coral, sea shells and pearls. My base board was an old book cover and I painted it with a wash of Snowflake and Stone Fresco paints, mixed to give just the shade I wanted. 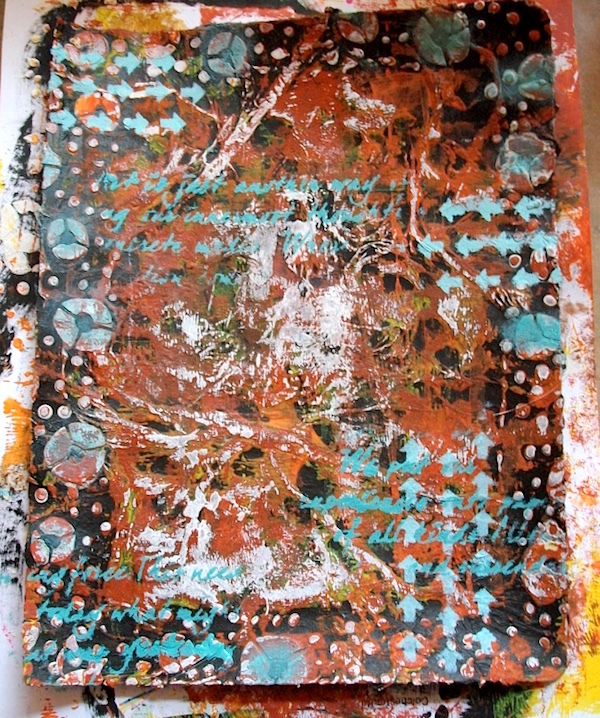 I then added the tiniest dash of Brown Shed Fresco paint to the mix and lightly stencilled some coral onto the board. The little boat was cut in half and attached with hot glue, and I then stamped along the bottom of the board with a stamp from the HotPicks 1201 stamp set. 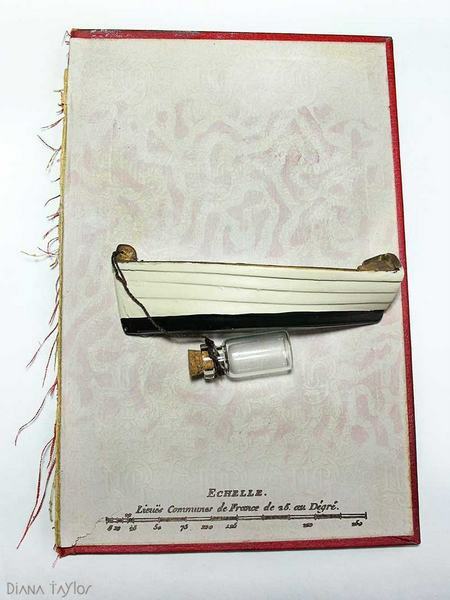 I added a Tim Holtz vial to the boat rope. 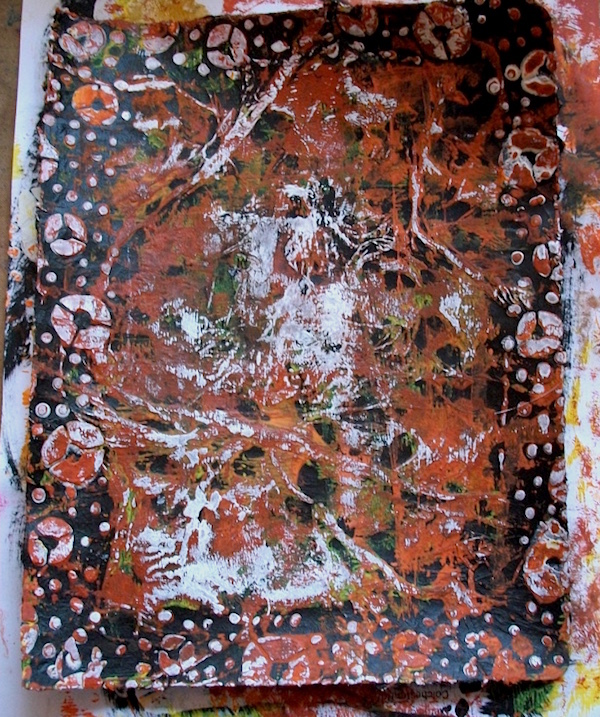 Using some old coral stencils and puff paint I made my own textured coral. I brushed a thin layer of Xpandaprint puff paint (from Art Van Go) through the stencils and onto Lutradur, which is a meltable material that shrivels and distorts. 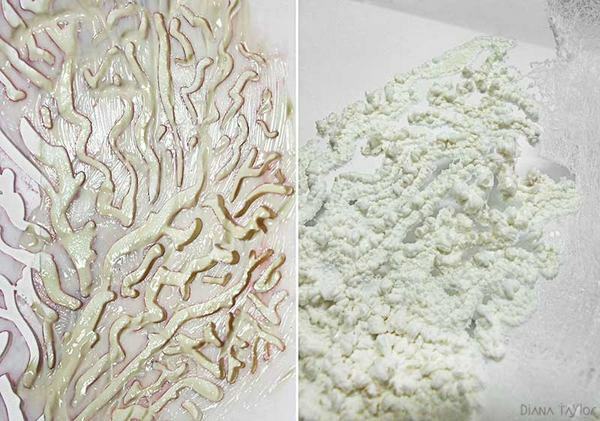 When I then heated the stencilled image with a heat gun the puff paint puffed up and expanded to create a textured surface and the Lutradur melted and disappeared, leaving only the coral shape. I was then able to tear and snip the coral into the size I required. 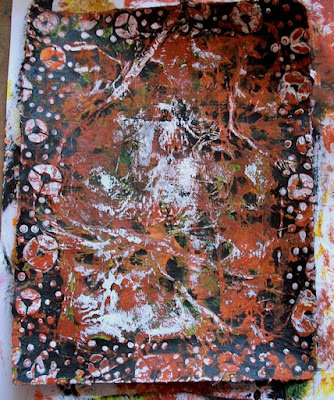 A similar effect can also be achieved stencilling puff paint onto tissue paper, and I know other brands of puff paint work well on this. You do have to be careful not to burn the tissue paper though, as it's so delicate! I lightly stamped PA Mini 62 text stamp several times over the base board in brown ink and then started adding the textured coral pieces. 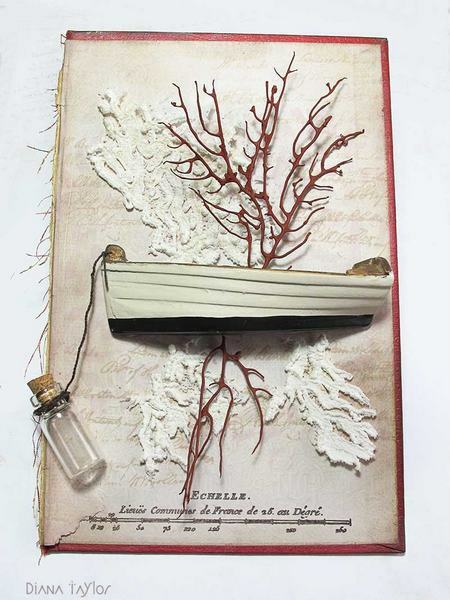 I also added some sea fan twigs that I had painted with Brown Shed Fresco paint. I filled the boat with clay and let it dry for a few days. I made some small clay shells, using a silicone mould and gently highlighted them with Treasure Silver around the edges. 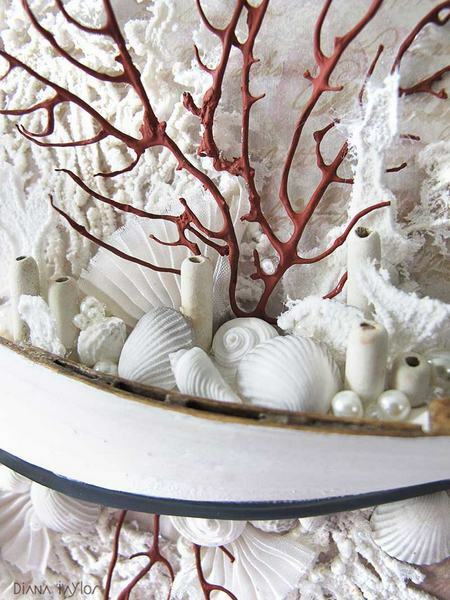 With a hot glue gun I attached the shells in and around the boat and added some pleated silk, some old clay pipe stems, more Lutradur coral pieces and some pearl and glass beads. A small piece of torn paper distressed with Walnut distress ink and stamped with PA Mini 62, was rolled up and put in the bottle. I have really enjoyed doing this project and I love the technique of stencilling with puff paint onto Lutradur, it creates some really great textures. 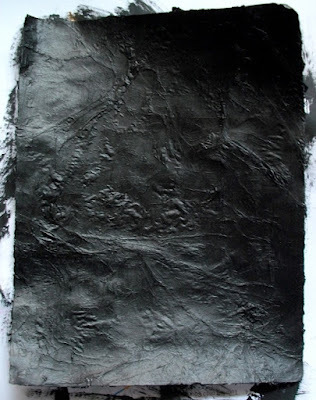 This is stunning Diana,the use of puff paint is such a cool way to achieve this texture, and wow so effective. 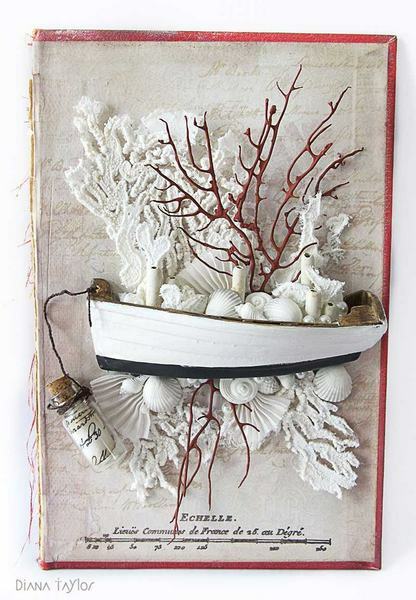 We all love to repurpose old book pages, but often the covers are forgotten: this is a beautiful way to use the cover, i especially love the loose threads still in place on the side. There is a busy weekend ahead! JOFY and Lin Teaching Together! Meanwhile, on Sunday/ Monday Mark and Leandra will be at the Retailer Training event at the Coventry Holiday Inn and Conference Centre. It's called The One Big Show, Organised by CHA UK, and you can see all the different manufacturers and the workshops they are offering here. I am teaching a JOFY class 11:30-1pm with her new stamps, and a Lin Brown class 3:30-5pm with Lin's new stamps. I believe there is still time to book your place. More info here. £50 for the Sunday gets you 4 classes (non-member), Members are Free for the first 2 staff, then £25 thereafter. So great value! 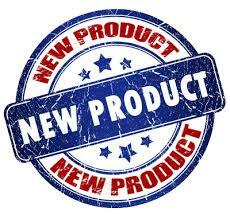 I would show you pictures, but of course it is all top secret...The big new product reveals do begin on the PaperArtsy blog from Sunday July 5th, in the meantime our retailers are buying the new stamps now ready to sell them to you from Sunday the 5th, 7pm. 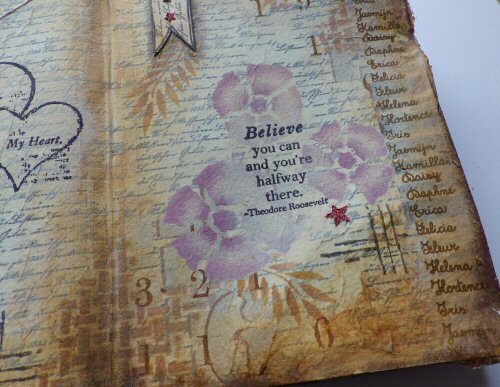 Hi everyone, Alison/Craftytrog here, joining you this evening with a journal page that has lots of layers of texture, paint, and stencilling. I love building up layers on a journal page, and seeing where it takes me. Step One: I'm working in a Large Prima Finnabair Sunrise Sunset Journal. 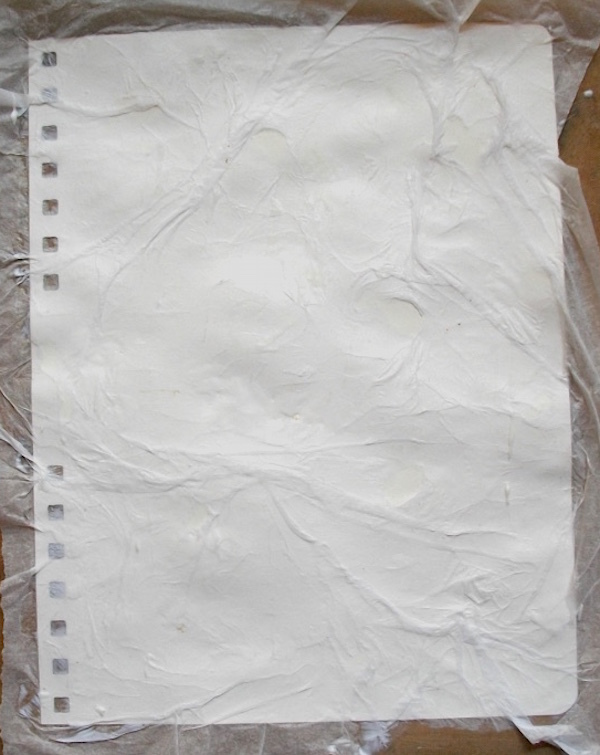 I removed one of the plain pages, then used Ranger Matte Medium to adhere a layer of White Tissue, scrunching the tissue to make lots of creases. Step Two: I painted a coat of Art Basics Heavy Black Gesso over the whole page. This provides a wonderful, dark base for all the colours to go over. Step Three: Next, I used a palette knife to apply Grunge Paste around the edges of my page, with PaperArtsy Stencil EEG 015. Step Four: Now to add some colour with my Brayer! I began with Yellow Submarine Fresco Finish Paint, then Tango, then Autumn Fire, then some Brown Shed and Chocolate Pudding. It was looking a bit Halloweeny and I wasn't loving that look, so I finished with some Snowflake to lighten it up. Much better! Step Five: Time for some more stencilling, and a contrasting colour! 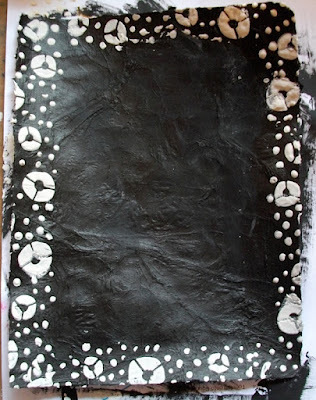 First, I used a Stencil Brush to add some arrows with Mermaid Fresco Paint and PaperArtsy Stencil EEG 018, then I used Bora Bora with the Crafter's Workshop Mini Art Is Stencil. 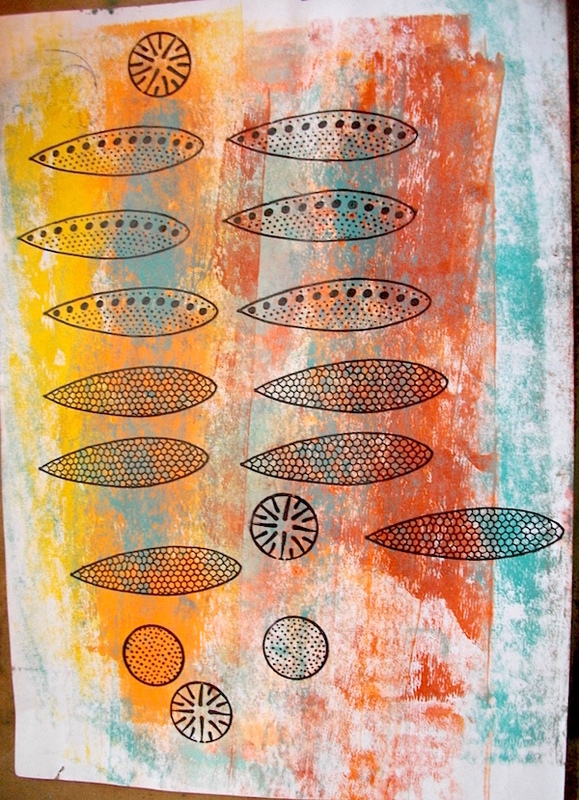 I used up the Bora Bora paint left on my Stencil Brush over the Grunge Paste Circles around the edges. Step Six: The piece of paper I used to clean my brayer on in Step Four, provided a great background to stamp some petals and circles from Ellen Vargo Eclectica Stamp Set EEV 09 onto. Step Seven: I also stamped the Nature Phrase from EEV 10 onto the above background, then cut out the petals, flower centres, and words. I wanted some extra texture, so I used Glossy Accents to glue some orange and red seed beads to the flower centres. Step Eight: Time to put my page together. I cut some flower stems from the leftover background in Step Six, glued these onto my page, added the petals, flower centres and words. I used a soft black pencil to outline the flowers, words and beaded circles, doodled some dots on the stems with a black Fineliner Pen, then glued some beads to the Grunge Paste circle centres to finish. I'm so happy with how this page turned out, although I almost gave up on it halfway through! Sometimes you need to persevere with adding more paint and stencilling until your artwork blossoms into something you like. Adding beads to your art is a great way to get some gorgeous sparkle and texture, and that extra bit of dimension.